Dailybuzz.ch: Malia Obama -- Forced To Fetch Coffee on Halle Berry's Show ... Welcome to Hollywood!! 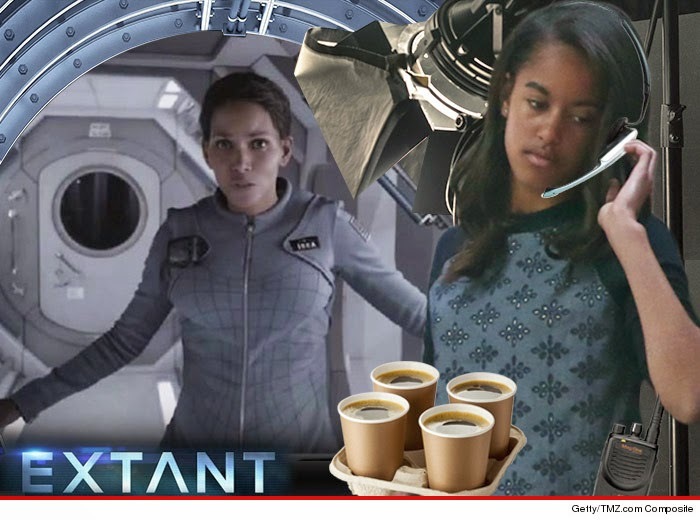 Malia Obama -- Forced To Fetch Coffee on Halle Berry's Show ... Welcome to Hollywood!! Even for President Obama's daughter ... breaking into Hollywood comes down to 3 words: cream or sugar? Sources on the set of Halle Berry's new TV show "Extant", says 15-year-old Malia Obama got very little special treatment during her week-long stint as a production assistant. We're told Malia spent most of her day going on runs for coffee and drinks for the cast ... like every other no-name peon. She also helped the crew by blocking people from walking through scenes during shooting. Of course, MO did get something not even Halle got -- Secret Service protection. We're told a few agents were always on set, but they gave her space. Best of all, we're told one person innocently chatted up Malia one day about sports -- just to be friendly -- but never realized who she was. Kinda cool that she never blew her cover.